Insider: Roger Dubuis Excalibur Huracán. Almost Like Wearing a Lamborghini on the Wrist. Taking inspiration from the Lamborghini Squadra Corse and its unique automobile aesthetic showcased in the Huracan Performante the watchmakers at Roger Dubuis have developed a few incredible timepieces brimming with racing design codes. Along with the new Roger Dubuis Excalibur Huracán Performante and its new movement —the RD630 with its 12-degree inclined balance wheel representing the calibre signature associated with Lamborghini—, comes the Roger Dubuis Excalibur Huracán with its 45 mm titanium case and the automatic winding mechanism displaying a rim‑like oscillating weight. The upper calibre features a strut‑bar designed bridge recalling the ones of the V10 engine of the Lamborghini Huracan super car. Posted on February 22, 2019 by Editor & Publisher and filed under Roger Dubuis and tagged Roger Dubuis Mainstream Brands Limited Edition Watches Roger Dubuis Excalibur Huracan Lamborghini Watch 2019 Roger Dubuis Huracan Most Popular. In 2018, inspired by Lamborghini Squadra Corse and its unique automobile aesthetic showcased in the Huracán Performante the watchmakers at Roger Dubuis have developed a timepiece brimming with racing design codes. One of the most striking features of the new aggressive Roger Dubuis Excalibur Huracán Performante is its brand-new ‘engine’: the RD630 movement with its 12-degree inclined balance wheel representing the calibre signature associated with Lamborghini. 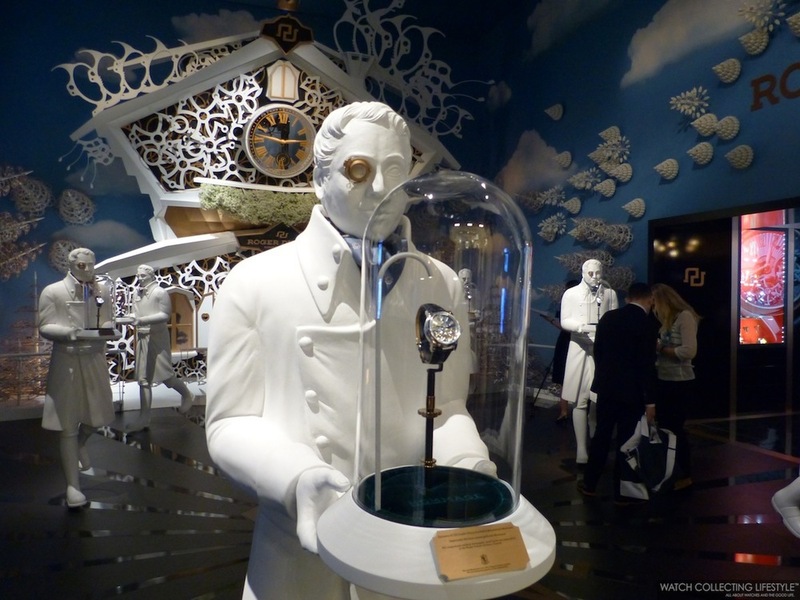 Posted on December 5, 2018 by Editor & Publisher and filed under SIHH 2019, News, Roger Dubuis and tagged Roger Dubuis Excalibur Huracàn Performante Roger Dubuis Mainstream Brands SIHH 2019 SIHH. News: Roger Dubuis Excalibur Knights of the Round Table III. The Legend Reinvented in a 'LowPoly' Design. In 2013, the legend of King Arthur provided inspiration for the release of the Roger Dubuis Excalibur Knights of the Round Table ref. RDDBEX0511. This exceptional watch cased in 18K pink gold featured 12 hand sculpted and engraved miniature knights also in 18K pink gold with their swords meeting at the center of a black jade engraved dial that intends to depict the Tudor English Oak Round Table made for Henry VIII. Then in 2017, Roger Dubuis released the Excalibur Knights of the Round Table II ref. RDDBEX0495 this time cased in 18K white gold and featuring the 12 knights in bronze. Both watches feature a 45 mm case and are available in a limited edition of 28 pieces each. Posted on August 22, 2018 by Editor & Publisher and filed under Roger Dubuis, News and tagged Roger Dubuis Excalibur Knights of the Round Table III Roger Dubuis Mainstream Brands 2018 Time Only Watches. News: Roger Dubuis Presents the Excalibur Spider Pirelli Sottozero at the Lamborghini Winter Accademia. A Limited Edition of 8 Pieces. The bite of icy air, the crunch of tires on hard packed snow and the thrill of truly money can’t buy experiences was the exhilarating setting for the adrenaline-packed launch of the new Roger Dubuis titanium-studded Excalibur Spider Pirelli Sottozero at the Lamborghini Winter Accademia in Livigno, Italy. Taking exciting high octane exploits to unprecedented new levels and inspired by the avant-garde designs and technical mastery of both its partners —tire maker Pirelli on one hand and Lamborghini Squadra Corse on the other— Roger Dubuis races off the grid in 2018 by offering red-hot performance in super-cold conditions. Posted on March 12, 2018 by Editor & Publisher and filed under Roger Dubuis, News and tagged Excalibur Spider Pirelli Sottozero Roger Dubuis Excalibur Spider Pirelli Sottozero Roger Dubuis Mainstream Brands Tourbillon 2018 Pirelli Zottozero Lamborghini Accademia. Insider: Roger Dubuis Excalibur Spider Skeleton Automatic 18K Pink Gold & Titanium. 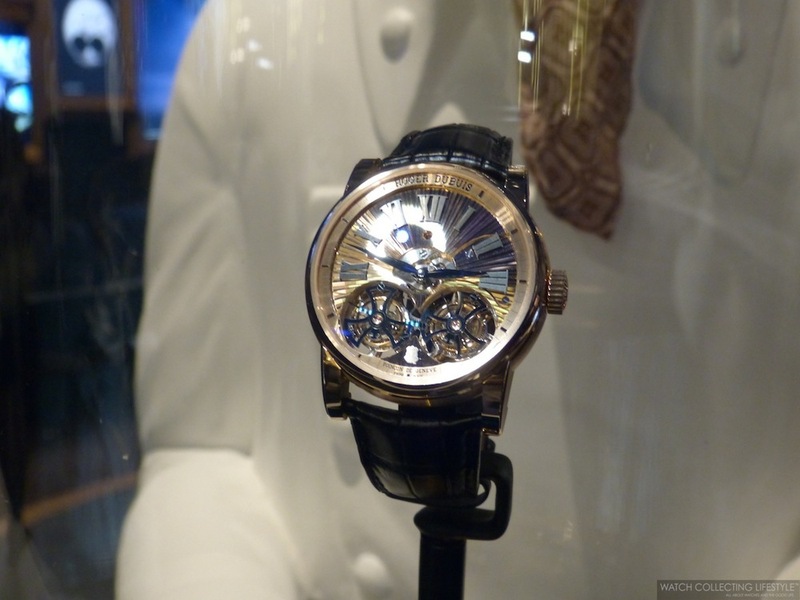 Hands-on Review in Honor of Roger Dubuis Who Just Passed. In honor of Monsieur Roger Dubuis who just passed this past weekend as we brought you the news here, we are bringing you this hands-on review of the Roger Dubuis Excalibur Spider Skeleton Automatic in 18K pink gold and titanium. This new watch released earlier this year at the SIHH 2017 brings warm tones in an interesting dichotomy that combines the density of 18K pink gold with the lightness of titanium, all rounded out by a gorgeous grey strap that matches the bezel and the dial. Posted on October 17, 2017 by Editor & Publisher and filed under Roger Dubuis and tagged Roger Dubuis Excalibur Spider Skeleton Automatic Gold and Titanium Roger Dubuis 2017 Mainstream Brands Most Popular. News: Roger Dubuis Passes at the Age of 80. Leaves Behind a Rich Horological Legacy. Sad news were received from the Roger Dubuis manufacture over the weekend as Monsieur Roger Dubuis passed on Saturday October 14th, 2017 at the age of 80. The statement from the manufacture read: "Mr. Roger Dubuis, our company founder has passed away today at the age of 80. His renown expertise in Haute Horlogerie, his disruptive vision, his human values will remain close to our heart. We are all committed to keep his unique spirit within our brand. Posted on October 16, 2017 by Editor & Publisher and filed under News, Roger Dubuis and tagged Roger Dubuis Mainstream Brands 2017. News: Presenting the New Roger Dubuis Excalibur Aventador S with Lamborghini. Two Highly Priced Limited Editions Available. Last week at the Lamborghini Headquarters in Sant’Agata Bolognese in Italy, Roger Dubuis released two new watches as part of their recently announced partnership with this automaker. The two new watches with pricing in excess of $190,000 USD each, are the new Roger Dubuis Excalibur Aventador S Yellow and the Roger Dubuis Excalibur Aventador S Orange. This new releases mark the start of the partnership between Roger Dubuis and Lamborghini, two brands sharing the same values in terms of technological innovation and customer experiences. Posted on September 27, 2017 by Editor & Publisher and filed under News, Roger Dubuis and tagged Roger Dubuis Excalibur Aventador S with Lamborghini Roger Dubuis 2017 Mainstream Brands Limited Edition Watches Roger Dubuis Excalibur Aventador S Yellow Roger Dubuis Excalibur Aventador S Orange Roger Dubuis Excalibur Aventador S Giallo Orion Roger Dubuis Excalibur Aventador S Arancio Argos. Insider: Roger Dubuis Excalibur Spider Carbon Skeleton Flying Tourbillon. Hands-on with an Exceptional 28-Piece Limited Edition. Following the racing theme set by the new Roger Dubuis Excalibur Spider Pirelli Skeleton Automatic collection —the result of the partnership between Pirelli and Roger Dubuis—, comes the new Roger Dubuis Roger Dubuis Excalibur Spider Carbon Skeleton Flying Tourbillon featuring an oversized case measuring 45 mm in diameter in black DLC Titanium Carbon with highly contrasting red accents throughout the bezel, crown, strap and dial. Posted on August 22, 2017 by Editor & Publisher and filed under Roger Dubuis and tagged Roger Dubuis Mainstream Brands Tourbillons 2017 Roger Dubuis Excalibur Spider Carbon Skeleton Flying Tourbillon Most Popular. Roger Dubuis Excalibur Spider Pirelli Double Flying Tourbillon. Hands-on with an Exceptional Racing Inspired 8-Piece Limited Edition. As the 2017 Formula One Season is about to kick-off on March 26th, today we bring you one of the finest racing inspired timepieces just released less than two months ago at the SIHH 2017 in Geneva. The new Roger Dubuis Excalibur Spider Pirelli Double Flying Tourbillon is the result of a partnership between tire maker Pirelli and Roger Dubuis. Present in sporting competitions since 1907, Pirelli is the exclusive supplier for the World Superbike championship and many prestigious single marque championships, but above all of the Formula One Championship for which it has been the sole supplier since 2011. Posted on March 7, 2017 by Editor & Publisher and filed under Roger Dubuis and tagged Roger Dubuis Excalibur Spider Pirelli Double Flying Tourbillon Roger Dubuis Mainstream Brands Tourbillons Double Tourbillons. SIHH 2017: Roger Dubuis Excalibur Quatuor Cobalt Micro-Melt. Hands-on Live Pictures & Pricing. This year at the SIHH 2017, Roger Dubuis announced its partnership with Pirelli and a strategy based on disruptive materials and progressive complications. As part of their new alliance with Pirelli, there are two new watches —the Excalibur Spider Pirelli Double Flying Tourbillon and the Excalibur Spider Pirelli Automatic Skeleton — that we'll talk about in a couple of days. A watch that is not part of this alliance but one of the most impressive timepieces unveiled at the Salon this year is the new Roger Dubuis Excalibur Quatuor Cobalt Micro-Melt. Posted on February 2, 2017 by Editor & Publisher and filed under SIHH 2017, SIHH, Roger Dubuis and tagged Roger Dubuis Excalibur Quatuor Cobalt Micromelt Roger Dubuis 2017 SIHH SIHH 2017 Mainstream Brands Most Popular. SIHH 2016: Presenting the new Roger Dubuis Excalibur Automatic Skeleton Carbon. Hands-on Live Pictures & Pricing. Just in case men were feeling a little neglected at the SIHH 2016, considering that the main focus of the Roger Dubuis novelties was around ladies' pieces, the brand decided to present the new Roger Dubuis Excalibur Automatic Skeleton in carbon and in stainless steel. First presented at the SIHH 2015, the Excalibur Automatic Skeleton became Roger Dubuis’ first non-tourbillon skeleton timepiece, powered by its first skeletonized automatic movement. Posted on February 1, 2016 by Editor & Publisher and filed under SIHH 2016, SIHH, Roger Dubuis and tagged Roger Dubuis Roger Dubuis Excalibur Automatic Skeleton Carbon SIHH SIHH 2016 Most Popular. 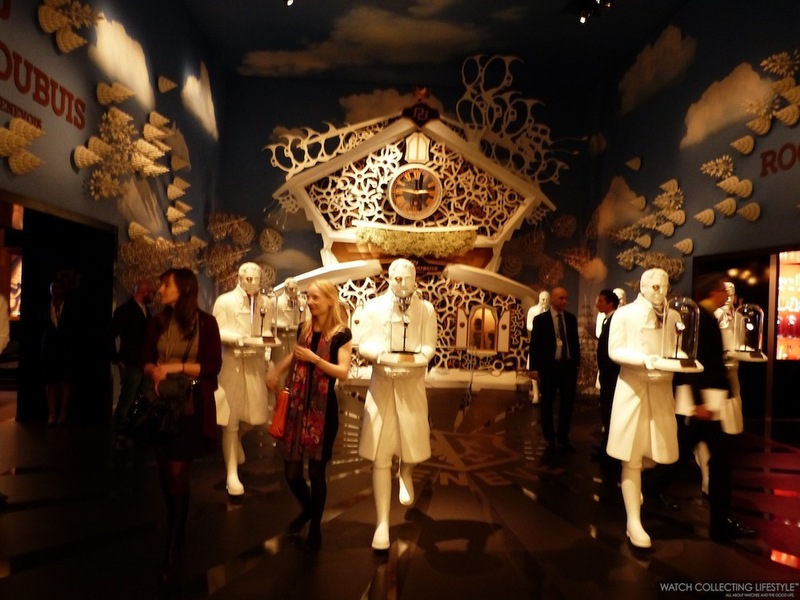 SIHH 2014: Experience the Roger Dubuis Pavillion. Pretend You Came Along. 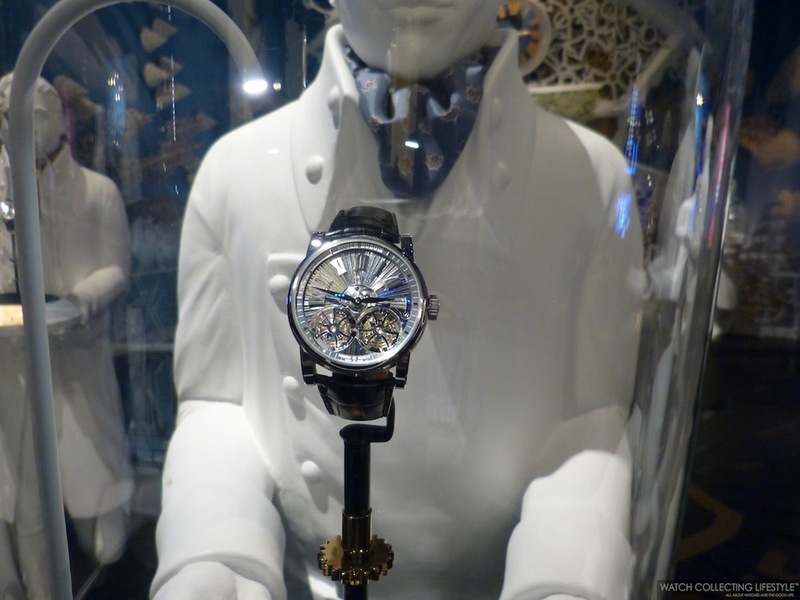 Posted on January 22, 2014 by Editor & Publisher and filed under SIHH, Roger Dubuis and tagged Roger Dubuis SIHH 2014.